The multidisciplinary field of quantum computing strives to exploit some of the uncanny aspects of quantum mechanics to expand our computational horizons. Quantum Computing for Computer Scientists takes readers on a tour of this fascinating area of cutting-edge research. Written in an accessible yet rigorous fashion, this book employs ideas and techniques familiar to every student of computer science. The reader is not expected to have any advanced mathematics or physics background. After presenting the necessary prerequisites, the material is organized to look at different aspects of quantum computing from the specific standpoint of computer science. There are chapters on computer architecture, algorithms, programming languages, theoretical computer science, cryptography, information theory, and hardware. 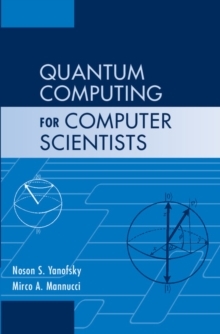 The text has step-by-step examples, more than two hundred exercises with solutions, and programming drills that bring the ideas of quantum computing alive for today's computer science students and researchers.